POLL: How should Bainbridge pay for road fixes? This week, a city report indicated the city will need to pay $2.5 million each year just to maintain the current condition of its roads. Read more about it here. The city hasn’t been coming close to that. Over the last four years, the city has put just $1 million into its road maintenance budget. This year’s $600,000 contribution was the highest in the four-year period. The city would have to more than quadruple what it pays now just to break even on its roads, according to the report. So, the big question is: where’s that money going to come from? The City Council is moving toward a ballot measure in 2013 that – if approved – would boost taxes for a big infusion of road-repairing cash, possibly in the range of $8 million. Others say the city should better manage the money it already receives from taxpayers, spending less on overhead and more on asphalt. And of course there’s always the $20 car tab fee that’s been debated on the island for years. The $440,000 it would raise for roads each year isn’t nearly $2.5 million, but it could help. Or maybe roads aren’t such a big deal. Some residents have urged the city to leave the roads as they are and put more money into arts and cultural programs boosters that they say drew people here in the first place. A few islanders even prefer a few potholes here and there to keep people from speeding. What do you think? Cast your vote in the poll over to the right. Last week, I wrote a story about the revival of “Minnie Rose Lovgreen’s Recipe for Raising Chickens.” The book is an oral history of sorts focused on an old-time islander’s methods of making hens happy (and getting a lot of fresh eggs at the same time). You can read the story here. While talking to Nancy Rekow, who first published the book in 1975, she mentioned that the road named after Lovgreen’s family has long been misspelled on city street signs. The road, which intersects Highway 305 south of Day Road, is titled “Lovegreen” road. Note the extra ‘e’. Rekow said several longtime islanders have pointed out the typo, but the city’s been slow to respond. Fortunately, a new form of government – heralded as the more responsive and effective alternative to the musty old mayor-led kind – is taking shape at City Hall. Bainbridge Island requested about $11.3 million in project funding from President Barack Obama’s $787 billion stimulus plan. 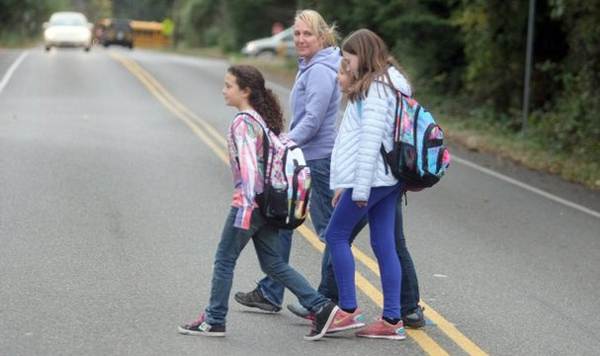 Most of Bainbridge’s requests, which were submitted to the Kitsap Regional Coordinating Council earlier this month, are for road repairs and non-motorized transportation improvements. Crews were working overtime during the weekend and on Monday morning to clear snow-laden roads and restore power to over 3,000 darkened homes. Puget Sound Energy notified Bainbridge Island Police on Monday that four repair crews would soon be joined by teams searching for downed power lines, fallen branches and other problems causing blackouts around the island. Parts of Winslow lost power at around 5 p.m. on Sunday while surrounding areas flickered out on Monday morning. By the afternoon, a handful of downtown businesses found power restored, only to lose it hours later. Bainbridge City Hall, which opened two-hours late on Monday, was without power all day. Many staff relied on the light coming in through windows to do their work. Bainbridge police were inundated with calls over the weekend and on Monday to assist motorists struggling with snowy conditions. “A lot of people are getting themselves stuck or are sliding off the roads,” Police Chief Matt Haney said. Haney predicted driving conditions would worsen on Monday night. Bainbridge City Hall was closed at 11:30 a.m. today due to the snow. The municipal court is also closed. City road crews and other essential services are still in operation. For updated listings on road closures, visit the city’s website at www.ci.bainbridge-isl.wa.us. County-wide road closures are posted here. Additional information is available at the city’s emergency phone line, 842-7633. The snow’s coming down thick here at the Kitsap Sun’s island outpost. School’s out. Library’s closed. City meetings are called off. But the snowman making contest is on. Starts at 2 p.m. at Ericksen Park (between Ericksen Ave and Hildebrand Lane). -Bucklin Hill Road between Eagle Harbor Drive and Lynwood Center Road. -Koura Road between Highway 305 and Meadowmeer Circle. -Valley Road at Park Hill Place. If you aren’t up to a making your own Parson Brown, you can read the Sun story about the icy sabotage at the Bainbridge school district bus barn, and the angry, angry comments that follow. But why do that when the snow’s falling? Mayor Darlene Kordonowy wants to trim more than the fat. Her combined $135.5 million budget proposal for 2009 and 2010 would cut into the meat of emergency services, city staff and several core city functions to offset a continuing trend of falling revenues, largely because of the island’s slowing housing market. “We’ll have to do more with less,” Kordonowy said during her presentation of the biennial budget to the City Council on Wednesday night. City staffing levels, under her proposal, would take a 10 percent hit, knocking the city’s 152 full-time positions down to 140 in 2009 and 138 in 2010.